Industrial companies that use exhaust air purification to reduce VOC or odors have a number of requirements for the technology to be used. So this should be distinguished by low space and high operational stability in addition to the lowest possible investment and operating costs. Flexible options for adapting to operating conditions with regard to future production-integrated emission reductions or conversely capacity expansions are further desirable benefits. The irradiation with UV light for disinfection has long been known and tested. The use for oxidative degradation of VOCs and odors in the air, however, has only reached the point of application in recent years. The advanced new photo oxidation technology already shows possibilities to meet these diverse requirements. UV light consists of electromagnetic waves whose energy content is directly dependent on the wavelength λ. The shorter the wavelength, the higher the energy of the radiation. UV radiation can be differentiated into UV-A, UV-B, UV-C and VUV. VUV (vacuum UV, also far UV) is the radiation <200 nm and thus the most energetic form, which is available for technical exhaust air purification processes. A typical UV lamp emits different wavelengths. If you want to split a pollutant directly by radical chain reaction by means of UV light, so this pollutant must also be able to absorb this wavelength (Figure 2). That is, the absorption maximum of the pollutant and the emission maximum of the lamp should ideally coincide. This reaction process is called photolysis. These maxima are known for almost all compounds and functional groups. They depend on the types of chemical bonds involved. By integrating photolytically active catalysts in the reaction space or downstream oxidative catalysts, these processes can be further enhanced. The photochemical effect of UV radiation is used specifically to destroy the pollutants. The reactions triggered in this case run off with sufficient irradiation time until complete mineralization. For the odor removal, only a partial reduction to less odoriferous products is required. There are two main types of radiators depending on the filling pressure: low-pressure radiator (ND) and medium-pressure radiator (MD). Low-pressure lamps have filling pressures <1 bar, which makes it possible to generate discrete emission lines at 185 nm and 254 nm (Figure 3). These lamps are commonly used for disinfection and are available throughout the world as a mass product with power ratings from 10 to 400W. This class of emitters can also be used for specific odor elimination by targeted specific modifications. The advantage of these systems is the generally very high percentage yield of UVC power. 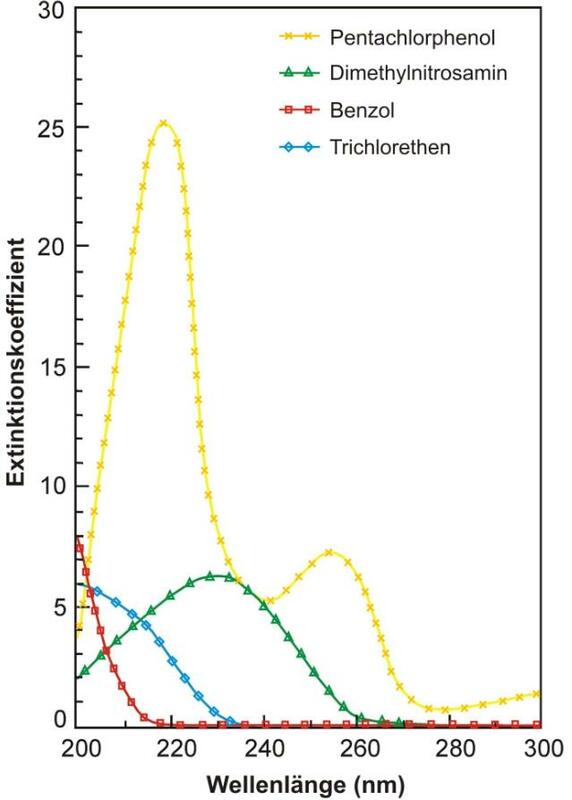 The filling pressure of medium-pressure lamps is 1 to 10 bar, which means that quasi-continuous emission spectra and outputs from 1,000 W to 32,000 W can be realized in the tightest of spaces (Fig. 4). 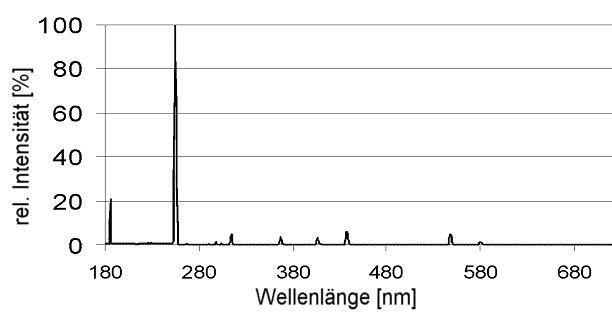 Due to the possibility of adapting the emission spectra to the absorption spectra of the pollutants, one therefore always has to do with a specially developable product. The advantages of these lamps, which have been further developed in recent years, are high energy densities and VUV yields, long service life, polychromatic emissions and low operating costs. The exhaust gas to be irradiated is passed through the UV reactor with a residence time of a few seconds. It flows through the treatment section in the UV reactor along specially arranged UV lamps with high efficiency. The UV lamps in the reactor build a homogeneous radiation field due to their arrangement. The UV oxidation systems based on the principles of the new photooxidation are designed for continuous or discontinuous use. For continuous control of system performance, external online measurements or other process parameters can be integrated. In this way, the UV oxidation cleans air without leaving any residue. UV oxidation systems based on the principles of the new photooxidation have proven successful for years: e.g. for the treatment of exhaust air and the elimination of odor emissions. 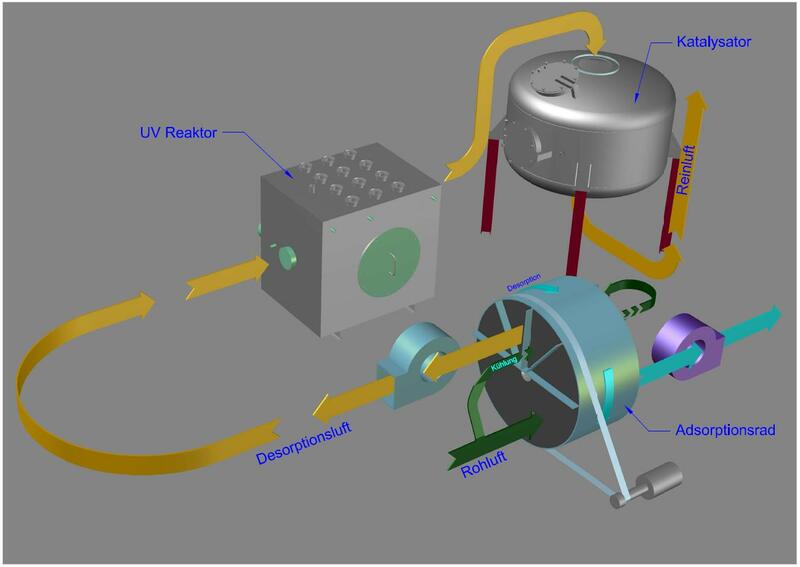 The UV oxidation systems based on the principles of the new photooxidation offer a number of decisive advantages through design and execution. The modular design of the systems allows the adaptation directly to the special needs of the operator. The integration into existing systems and facilities can be done by connections according to customer requirements and in various mounting positions with minimal space requirements. Cleaning and maintenance work can be carried out by employees of the plant operator without any loss of time. The systems consist of standardized, robust mass-produced components and increase the availability of the systems thanks to their proven reliability. The maintenance costs are low. The UV systems are low maintenance and easy to operate. In direct photooxidation (DF), the exhaust air flow is treated in direct flow with UV light and optional downstream catalytic converter (Figure 5). The resulting waste heat is used by means of recuperative heat exchanger for heating the polluted blank air. The necessary power input for the oxidation reaction is minimized. Some of the pollutants are degraded directly by photolysis in the UV stage. Through ozonolysis and homolysis, further VOCs are mineralized further into the catalyst stage. Furthermore, UV irradiation by excitation of the VOC molecules causes a lowering of the required activation energy for the system VOC catalyst, i.e., the temperature operating range of the catalyst is extended downwards. This leads to lower heating requirements (operating costs) and energy costs as well as a reduction of the required contact times and thus catalyst quantities (investment costs). Conversely, this greatly increases the effectiveness of the catalyst stage. The process of direct photooxidation followed by catalytic oxidation thus allows savings in investment and operating costs compared to a common KNV of about 25 to 75%. This process concept is usually used at high constant VOC concentrations (as well as after concentration). Preferably, when a (nearly) autothermal mode of operation is possible or the volume flows are so small that greater equipment-technical effort is not worthwhile. On the other hand, if the pollutant concentration courses are fluctuating and / or at a low level, the method of regenerative photooxidation (RF) is recommended. Here, the air streams are passed through an adsorption stage, which deposits pollutants. The purified air stream emits residual concentrations according to the permissible limits. The adsorbent is then periodically regenerated in a separate cycle, either periodically with adsorption filters (AF) or continuously with adsorption wheels (AR). The two variants serve different applications. Due to the uniform concentration, the regenerative photo-oxidation as well as the direct photo-oxidation can significantly reduce the operating costs due to lower catalyst quantities and temperatures compared to a KNV of approx. 25 to 75%. In addition, the much smaller regeneration air flows can also be used to realize smaller, space-saving cleaning modules, which in addition leads to further savings in investment and operation. 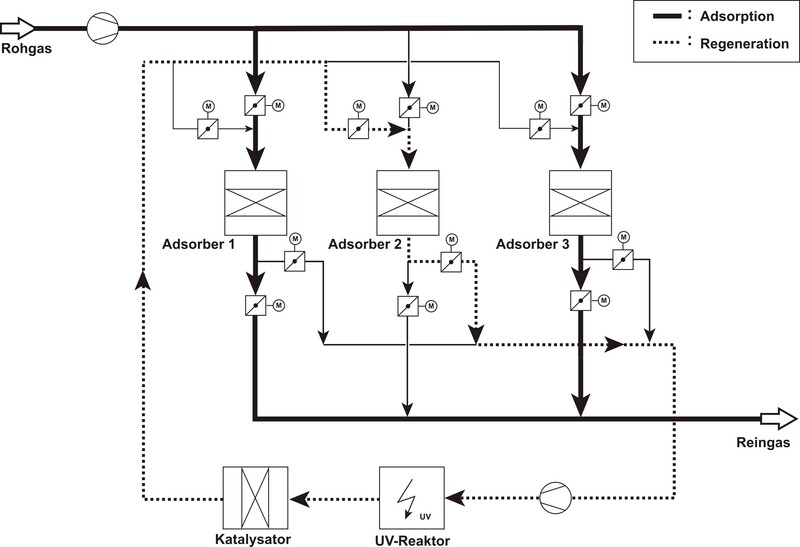 In the case of regenerative photooxidation by means of an adsorption filter, the VOC-loaded main stream is alternately passed through two parallel adsorption stages (in 24-hour operation) (Figure 6). Here, the fluctuating VOC loads with high or low pollutant concentrations are completely deposited on below the emission limit by adsorption by means of a suitable adsorbent. The escaping exhaust air permanently meets the required clean air limit values. Even before exhaustion of the adsorbent is switched to the second parallel fresh adsorption. The first stage goes into a UV operating phase in the regeneration cycle. This circuit is operated by blower. The circulating air is passed through a UV stage and then over a catalyst stage before it returns to the adsorption stage. 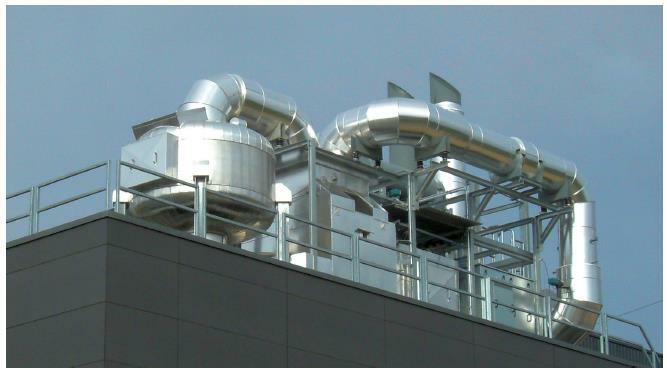 Due to the energy input of the UV radiation, the circulation air heats up to operating temperatures that are required for the desorption and regeneration of the adsorbent and for the operation of the catalyst stage. At elevated media temperatures, the previously adsorbed organic pollutants are expelled again quickly and evenly from the adsorption under defined conditions and fed with the circulating exhaust stream of UV photo-oxidation with downstream catalysis. Here they are then mined to complete mineralization (CO2, H2O). This procedure allows constant and high VOC concentrations to be set, which dramatically increase the effectiveness of the UV stage. The rapid desorption leads to significantly shorter regeneration times compared to the adsorption times. 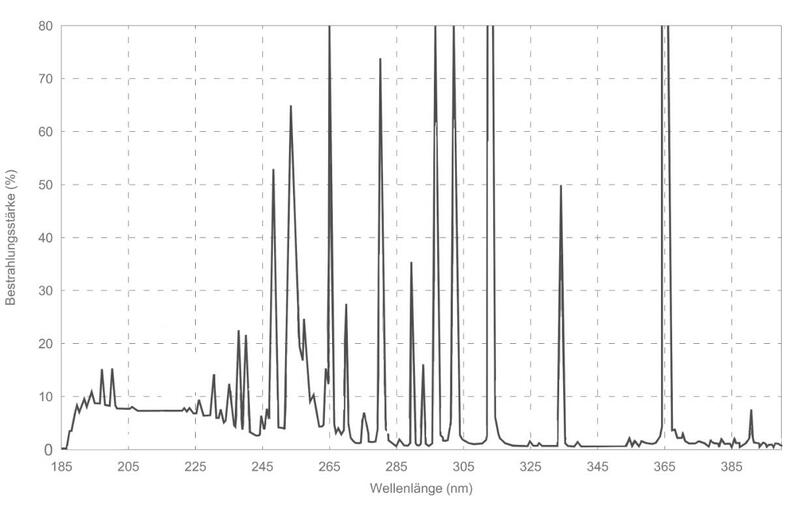 After falling below a predetermined concentration value, the UV stage is turned off. The adsorption stage is cooled down and is then regenerated again ready for the adsorption mode in standby. Depending on the raw air concentration, the systems are usually designed for a regeneration period of 15-35% of the adsorption time. Compared to direct photooxidation, this procedure allows enormous savings in resources such as electrical power, lamps and catalyst. In addition to increased effectiveness, the value-intensive components such as UV lamps and the catalyst used are protected against deposit formation, poisoning and blocking by aerosols, dusts and other aggressive ingredients in the main stream. This process variant is usually used when very long service lives are expected or so-called high boiler VOC require a desorption temperature of >200°C. In the event that sufficient downtimes are available between operating times (for example 1- or 2-shift operation), a one-way variant can also be used. In the event that no high boilers with desorption temperatures >200°C are expected in the exhaust air, can also be switched to a continuous cleaning of the adsorbent. This in turn has the advantage that the constant temperature change of the system components is minimized. For an emission operation for predominantly low to medium or strongly fluctuating pollutant concentrations, a so-called adsorption wheel is used, also called regenerative photooxidation (RF) by means of adsorption wheel (Figure 7). Here, the raw air stream flows through a continuously rotating rotor made of mineral fibers in the axial direction, which is filled with adsorbents (usually zeolites). In this case, the proportionate cross-sectional area (adsorption zone) through which flows through corresponds approximately to the desired concentration ratio. The raw VOCs are deposited on the adsorbents. The cleaned air stream escapes. A fraction of the raw air first flows through the so-called cooling zone and cools the part of the rotor that just leaves the hot desorption zone. In the further course of this stream is further heated by recuperators until it is hot enough to desorb through the desorption zone, the deposited VOC in a high uniform concentration. This small concentrated stream is fed to the photooxidation stage with downstream catalyst stage, cleaned and also emitted.